We used to be pretty close. Tight, even. But we've grown apart considerably over the last seven months, to the point where I just can't see myself in you anymore. It wasn't all bad, but still, it's time for me to move forward. Red collared shirt, we went through an awful lot together. You held me together during my first real date with a boy, and even though things didn't work out with him, I still felt happy when it was me with you. Multicolored sundress, I loved you immensely. 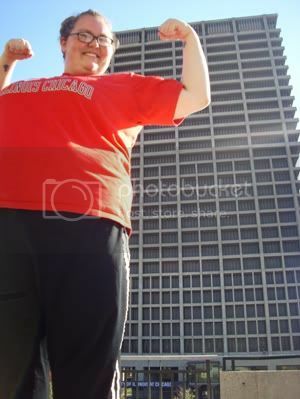 I thought you were so pretty, and twirling around in you made me feel so free and cute that I'd temporarily forget the fact that I was 210 pounds away from my dream long-term goal weight. But I used you, especially towards the end. I wore you every single day not because I loved you, but because you were all I had and I was desperate. Black workout pants, we went through so much together. So much sweat! (Sorry that was probably gross for you.) Remember when we raced up the stairs? Thank you for supporting me through that. I never thought I could do it, but I did, and you were there for the whole ride. Green sweater, I just might miss you most of all. I felt so lovely in you, especially when paired with pearls. 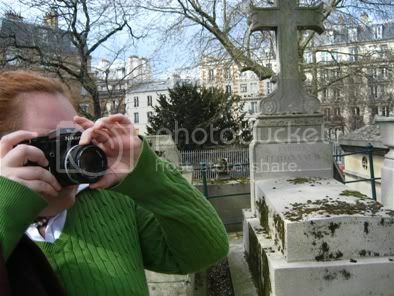 I wore you on one of my favorite days in Paris, the day we went to Père-Lachaise cemetery and the cabaret! We looked so good together. Thank you all for being there for me when I needed you - I'll never forget the good times we had! But it's time for me to move on to smaller and better things. P.S. 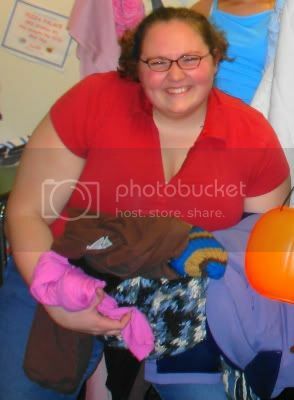 I *did* hold on to a few things - the orange shirt from my before picture, my biggest pair of jeans, and my biggest pair of black work pants. The rest of it got bagged up to be donated or trashed (unfortunately, a lot of my stuff either had holes or stains). I'm feeling incredibly light and rather good about it all. Happy 200th post to me! I am so proud of you / happy for you, Mary! You, my dear, are INCREDIBLE! I loved the "tight even" comment. HAHAHAHA. Awesome Mary! Awww yay! Getting rid of clothes is so oddly hard!! I'm a bit of a hoarder with clothes, and my closet is a bit scary looking. I recently went through a bunch and filled a basket but I know I could throw out so much more! Awww, here's to a whole new set of favorite clothes!! So proud of you!! Happy 200! Congrats! I need to go thru some clothes too. It's a good, but also complicated feeling. Yay! Bye Bye old clothes!!!! Saying goodbye is not always a bad thing! Just think of all the cute clothes that you'll WANT to wear, not because that's what you have to wear but because you really want to! Another bonus....small clothes are cheaper! Success all around! Good for you!!! Now you can go out and buy a new wardrobe! Congrats on your 200th post! And though it was hard to get rid of the clothes, I hope it gave you sense of accomplishment, too! You've done such an awesome job. Wow - what hard work you have put in! Congrats! Happy 200th Post. I think purging your old clothes can be very theraputic. Let's hope your new smaller clothes in the future will provide just as many great memories/moments as these. Je sais que c'est une étape difficile. C,est comme si tu disais aurevoir à la vieille mary, mais tu ne connais pas encore la nouvelle Mary. Mais une fois que tu as pris la décision tu as du te sentir bien. Bravo encore ! Good for you for letting go. It's freeing! !